Tom: Mikkoku is a game that I've been working on from 2003 till now, using the tool RPG Maker 2003. Mikkoku is a traditional J-RPG and has much in common with other games of the genre, such as the SNES Final Fantasy games. 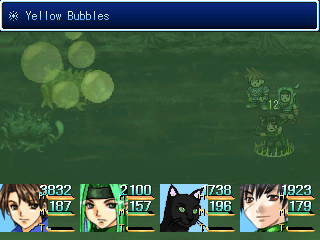 For instance, the Active Time Battle system and the graphical style itself. Additionally, the game was also inspired by the slightly underrated but brilliant Suikoden games, in two regards. 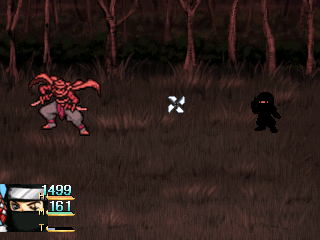 First of all, Mikkoku features a large cast, just like Suikoden. While the majority of these characters will join you story-wise, there are also a lot of optional characters that you can recruit under certain conditions. Secondly, like in Suikoden, the heroes will eventually get their own headquarters which will serve as a base of operations. This headquarters will develop throughout the game, but can also be further enhanced by recruiting support characters, like a librarian, a musician, a monster trainer, a cook, etc. The game features an elaborate class system (with over 50 unique classes!) that distinguishes all characters in combat. Staple classes such as knight, wizard, healer, archer, thief, ninja, summoner and monk are included but there are also a lot of less straight-forward classes such as samurai, gambler, shanologist, dancer, falconer, gladiator, stalker and many, many more. These classes are described in-depth in the characters section. Since you can usually choose your party members from a certain point onwards, this allows for many different party combinations and strategies. In my opinion, this is a perfect blend of both the Final Fantasy and the Suikoden battle systems: a large number of characters to choose from (similar to Suikoden), but instead of them being used mostly the same, they each have a unique class (like in Final Fantasy IV, VI or IX). Mikkoku has a large world map to explore with many different places to visit. And just when you think you have seen everything, there's even more... While the majority of all places is, obviously, part of the game's storyline, a large number of locations is completely optional. You may think of optional dungeons that hold great rewards for those who dare to conquer them, but also of towns in which you can recruit extra characters, retrieve special items or undertake interesting side quests. However, the feature that probably stands out even more is the epic storyline. The story of Mikkoku is quite complex and well developed, with several surprising plot twists. The main heroes (and villains) were also given plenty of backstory. The same goes for the setting of the game in general. 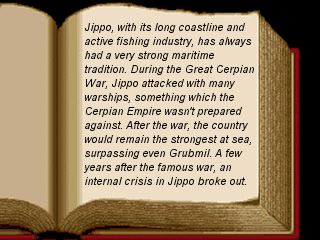 While a lot of it is not directly relevant to the game's plot, every country or area on the world map has its own history. You can read more about these in the world section. With this I hoped to create a world that feels as real and lively for players as possible. If you start playing Mikkoku, you can be sure to be entertained for quite some time. The game's lengthy story, combined with the vast world map and high number of side quests, should be good for at least 50 to 60 hours of gameplay. As the launch date of Mikkoku is slowly coming closer, I've decided it is time to create corresponding Facebook and Twitter pages. These should allow me to keep in touch my target audience on a more regular basis :). Please help me create awareness for the project and like Mikkoku's Facebook page and/or follow Mikkoku's Twitter account! Hyperlinks to this website (http://www.mikkoku.org) are also very much appreciated. Read more news or follow us on Facebook!